The immune system is designed to recognize and remove toxic bacteria, viruses, dysfunctional or cancerous cells, and other toxic substances that can harm the body. Immune functions may collapse under the effects of stress or physiological disorders. When this happens, the body cannot defend itself against aggressors and disease can set in. The immune system can also trigger an inappropriate immune response by attacking harmless substances. This is referred to as an intolerance or allergy, depending on the seriousness of the body’s reaction. In some cases, the immune system will attack the body’s own tissues, which it is designed to protect. These are known as autoimmune disorders, such as multiple sclerosis and rheumatoid arthritis. With all these problems, the body’s immune system needs to be “reeducated.” To achieve this, it is important to understand how immune functions can collapse or be disrupted. Inflammation is an immune system reaction to protect the body against external aggression and foreign bodies. We have all felt the pain associated with localized acute inflammation. For example, this is what happens when the body reacts to sunburn, a bacterial infection or ulceration. Your body heats up because the immune system raises your temperature in order to fight against the aggressor and to speed up the repair process. However, so-called low grade inflammation is less well known. It is not as localized as acute inflammation and tends to be chronic. Even though it is more discreet than the acute version, we are able to identify subtle physiological markers that indicate the presence of low grade inflammation, particularly in heart disease, metabolic syndrome (pre-diabetes), diabetes, Alzheimer’s disease, different forms of arthritis, osteoporosis and even some cancers. These markers are present in the blood and can be easily identified. This form of inflammation is an aberrant immune system response that can occur from various physiological stresses. For example, obesity, especially excess abdominal fat, causes low grade inflammation, which in turn leads to metabolic syndrome, then diabetes. Excess abdominal fat causes chronic and widespread inflammation and is therefore a significant risk factor for many diseases. Researchers have found that there is also high oxidative activity and a significant increase in free radicals in inflamed tissue during the inflammation process. In fact, inflammation and oxidation both play a role in causing several chronic diseases and accelerating the aging process. Healthy aging is therefore dependent on keeping inflammation and oxidation in check, which ensures that the integrity of the immune system can be maintained. This product also contains our turmeric extract, an effective anti-inflammatory; extracts of wild blueberry, green tea and cranberry, which are all recognized antioxidants; as well as the antioxidant vitamins C and E. Our turmeric extract is more effective than those typically found in stores. We have also added black pepper extract because the piperine it contains helps the body absorb more of the anti-inflammatory curcumin. Unfortunately, the technologies used by major producers of turmeric extract eliminate almost all of turmeric’s natural aromatic constituents (essential oils). This means that the turmeric extracts generally available to consumers are incomplete. We go to great lengths to ensure the essential oil missing from commercial products is added to our product so that you are benefiting from the complete extract. You will notice the difference as soon as you open our product and smell its characteristic aroma. 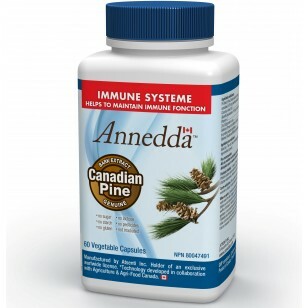 We have also added two trace elements essential to proper functioning of the immune system: zinc and selenium. The minerals in Annedda® products (selenium and zinc in this product) are chelated to improve their bioavailability. This facilitates their absorption by the body, which greatly improves the products’ effectiveness and, as per our promise, results in the best possible supplements that truly work. Extracts of: green tea, blueberry, cranberry, piperine, hypromellose (vegetable capsule). Take 1 capsule 2 times a day. Take a few hours before or after taking other medications. Take with food. Consult a health care practitioner before use if: you have gallstones or bile duct obstruction; you suffer from stomach ulcers or excess stomach acid; your symptoms persist or worsen; use extends beyond 3 months. Do not use if the safety seal under the cap is broken or missing. Keep out of reach of children. 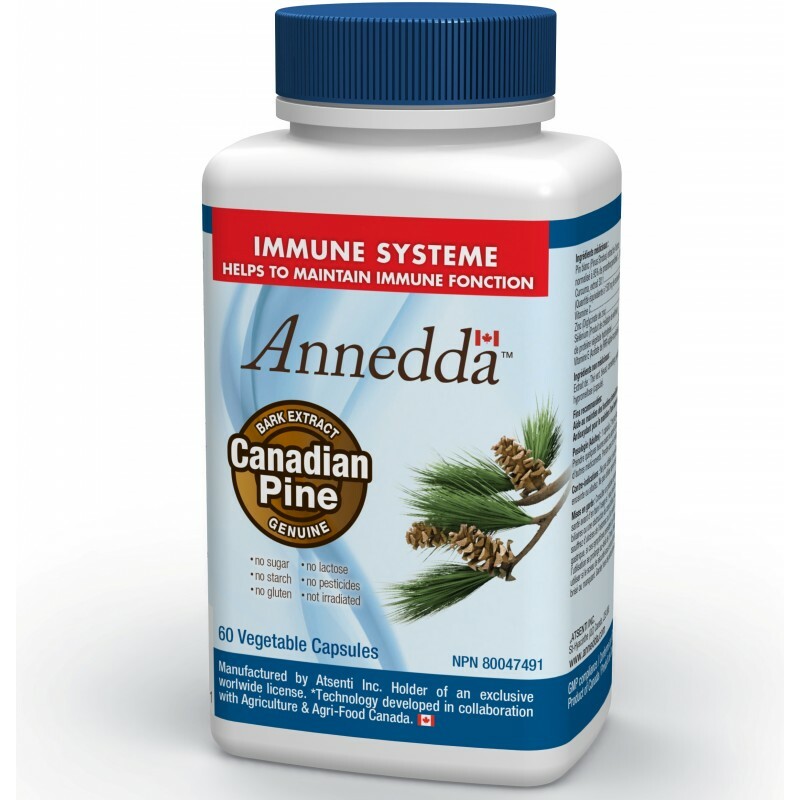 1- License #LIC-01185-326934 issued by Agriculture and Agri-Food Canada for the exclusive process of extraction, purification and isolation of active substances from the bark of the white pine tree. 2- Phytother Res. 2003 Jan;17(1):66-9. 3- J Med Food. 2001 Winter;4(4):201-209.